Your girl published a devotional book. Wanna talk about that ? There was a point in my Christian journey I stopped reading devotionals. 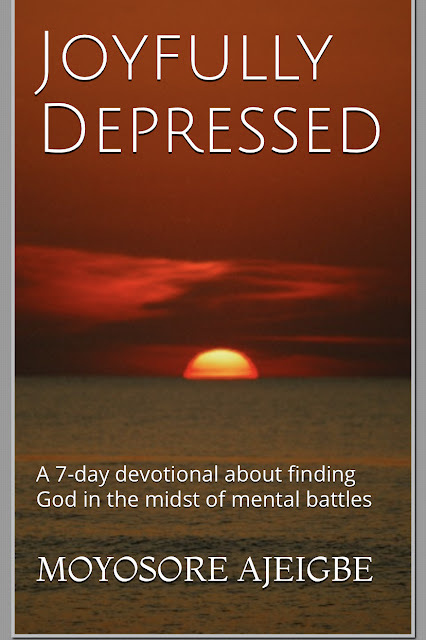 I felt they were too watered down and it was very easy to get in the habit of “read a devotional a day to keep the devil away” which leaves room for a shallow understanding of God and taking verses out of context. A few years later, here I am, writing a devotional. While I still think devotionals should only be supplemental resources that help us dig deeper into the Bible, I have come to appreciate their usefulness, if used appropriately. Christianity is very experiential and learning how other people interact with God, especially in times of difficulty, can give us the encouragement we need. I wrote this devotional because I struggled with studying the word (and still do to an extent) whenever I’m depressed. I knew the truth of God’s word in my head but I couldn’t get them to stay in my heart. Reading other people’s experiences and how they reconcile depression and faith was one of the many things that helped me and still continues to help me. I don’t want this devotional to be something you pick up as an absolute truth. The goal is for you to read this and be led back to the scriptures to find strength, hope and courage (2 Tim 3:16-17). I hope by sharing my personal thoughts and experiences, you yourself will experience God in the most intimate and personal way possible. To get this book on amazon, click the links for the kindle and hard copy versions. Because you are reading this post, I'd like to give you a free copy of the book ; you must be following the blog (you also have to confirm in your email that you're subscribed) to receive this. Talk space - a network of therapists in USA that offer alternative sessions such as phone calls or texts or video calls. BACP- website for finding counselors and therapists near you. Dr. Jess on Instagram - a psychiatrist in New York who does weekly Instagram live videos and talks about mental health problems as well as tangible tips on self care. Ndidi.health on Instagram - private psychotherapist in Nigeria.